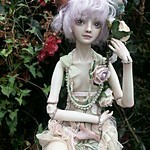 I think it would be fun to have an ongoing thread posting links to interesting porcelain bjd auctions on ebay! 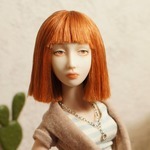 I guess that Marina Bychkova doll was removed from e-bay and was sold privately. Here are some dolls on sale on ebay. Maybe somebody might be interested. Thanks for posting! That JR doll has such a sad expression! I hope someone adopts her. That is exactly what i thought of her- very sad. The top one is a Sisterfox Princesses doll. Anyone who may have an interest in her and wants to know more about them message me- I have two! I updated the thread title to say "ebay finds" instead of "ebay alerts" since alerts sounded to me more like something people should be warned of than like something exciting to buy! And a new doll from Marina Skubenko.